Oh, boy! Only 17 sleeps until Christmas! Anyone else nervously biting their nails and wondering how they can possibly fit everything in?! 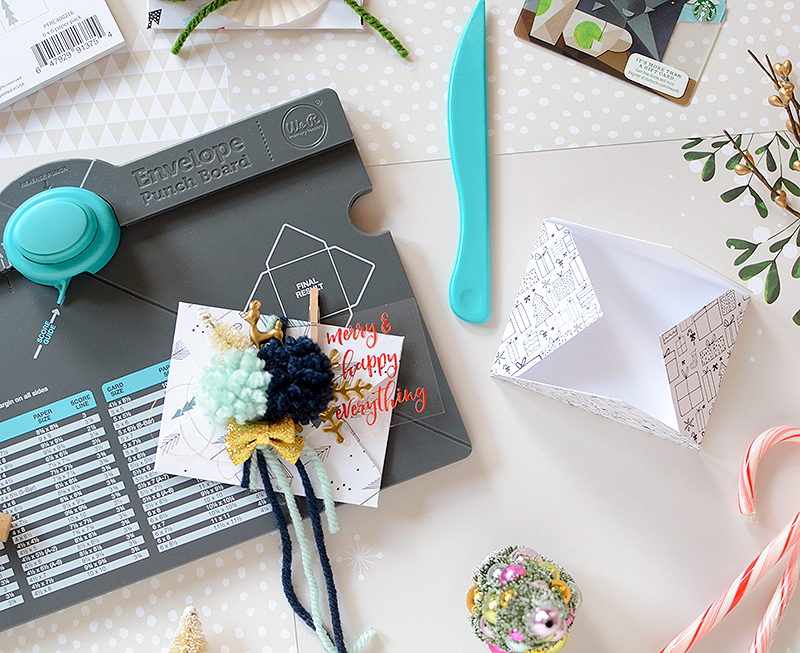 I'm feeling slightly better after using this blog post as an excuse to cross off a few gift wraps--7, to be exact! I'm focusing on gift cards because, let's face it; they're convenient and I find that folks like teachers, dentists, mail carriers, and our other helpful acquaintances seem to appreciate them. For my first set of holders, I put my Envelope Punch Board from We R Memory Keepers to work with the Oh Joy 6x6 paper pad. While there is a specific gift card size on the board, I actually made my envelopes just a bit bigger, opting for the 2 1/2 x 3 1/2 size instead. Following the directions on the board, I made 4 envelopes. I chose to use the smaller papers for a couple different reasons. The patterns are a smaller scale, and there was a lot less trimming required (just cutting each piece down to 5 1/2 x 5 1/2--2 simple cuts and not a lot of waste, plus I can save my larger sheets for larger projects). Also, the papers are only printed on one side so I didn't have to sacrifice a good design on the flip side! After I trimmed and folded my paper into its envelope form, I adhered the flaps, then tucked in each gift card and sealed the remaining flap. It was then time to decorate! 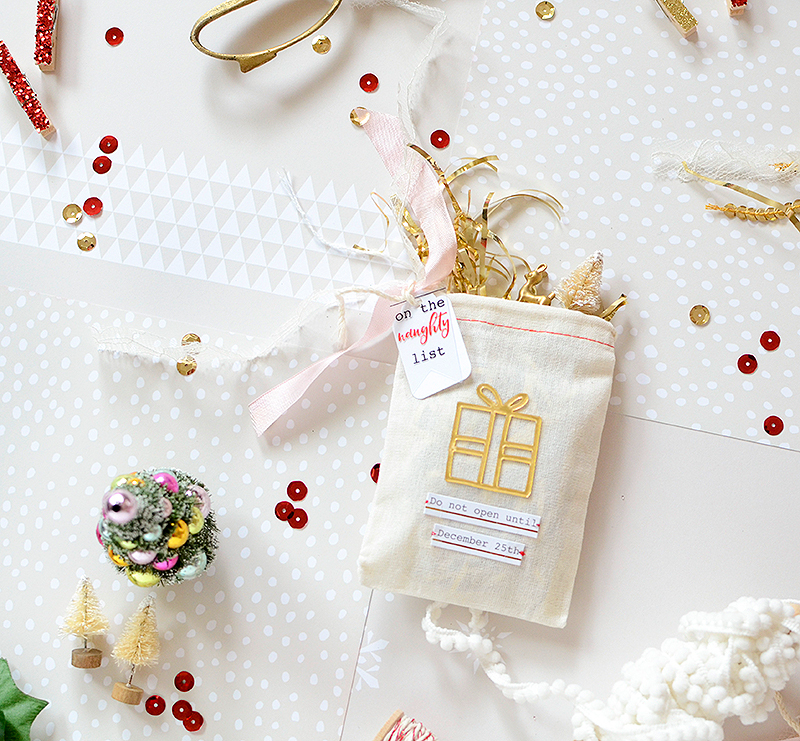 For last month's gift wrapping session, I used mainly the Oh Joy washi strips and stamps so this time around, I wanted to use other products like the acetate die cuts, puffy stickers, and gold mirror shapes. Although it may appear that these are heavily embellished and took a long time to construct, they really didn't. 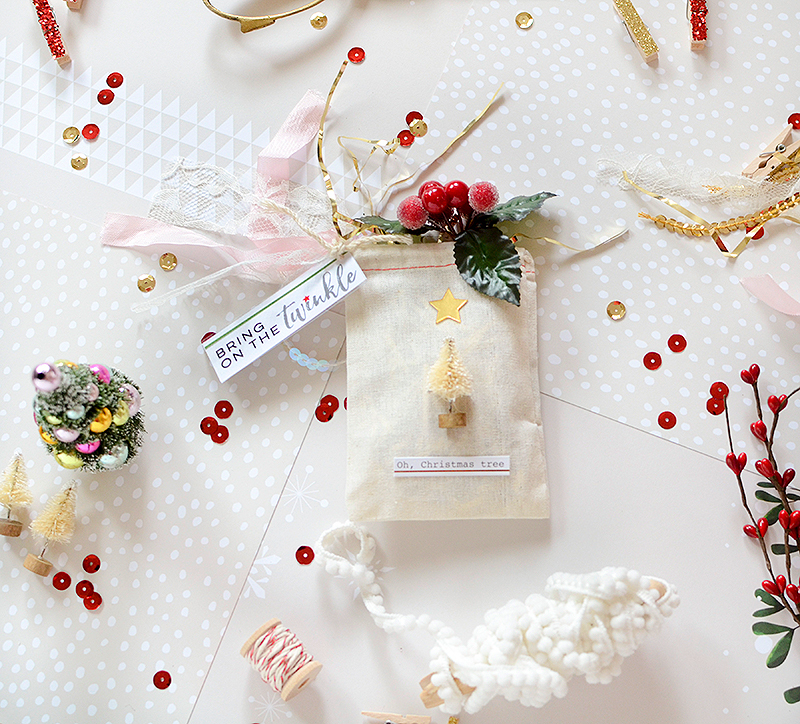 I used some of my favorite holiday wrap staples to accompany the Oh Joy elements. 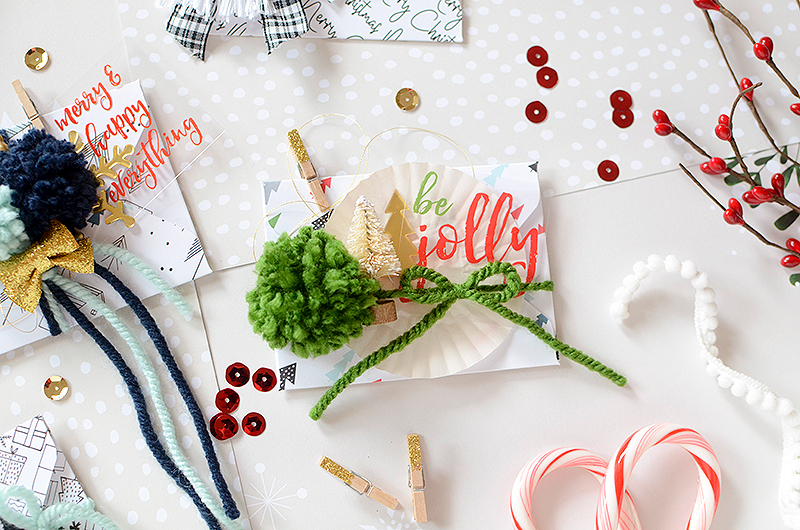 Wood clothespins, tiny sisal trees, mini pom poms, plus a few trims add warmth, dimension, and texture. 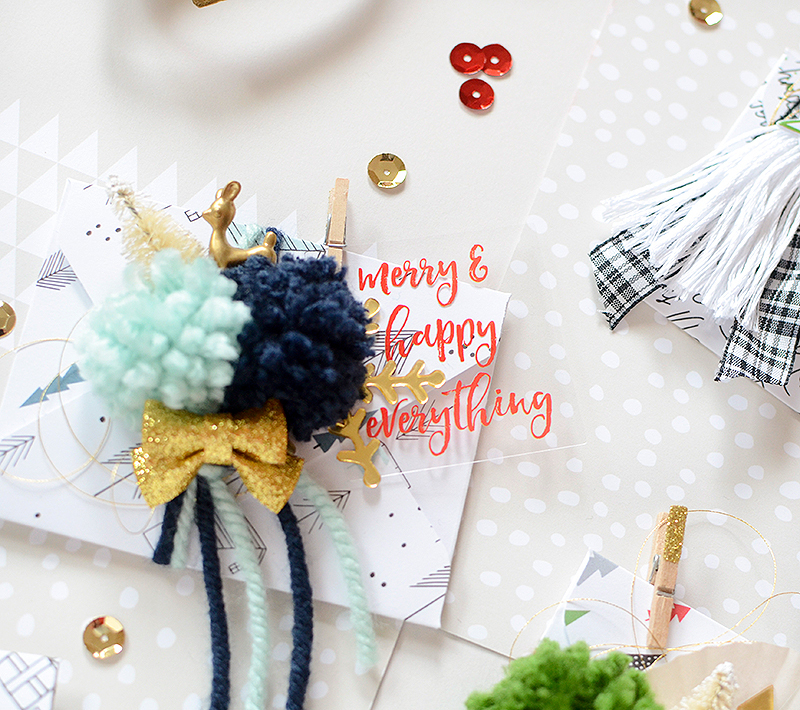 Last year, I started making yarn pom poms for the first time and definitely got hooked! Yarn, I think because it reminds us of woolen hats and scarves, is so cozy and warm. 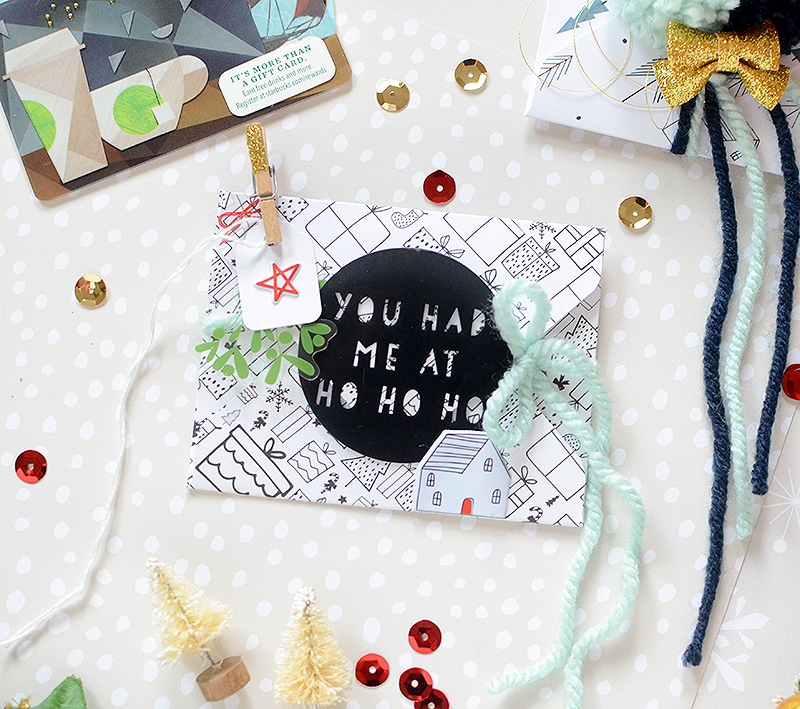 It adds a definite homespun feeling to the gift wraps. 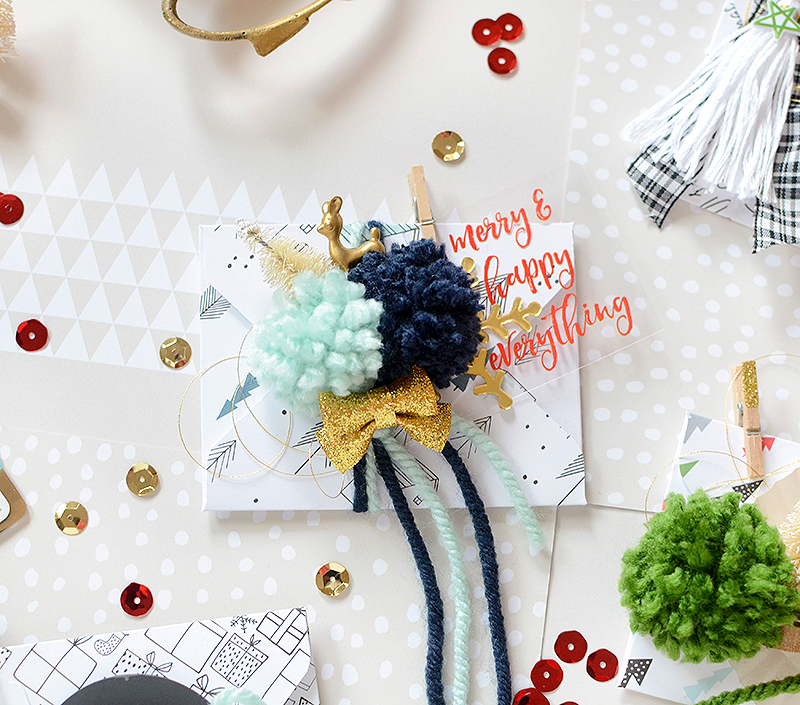 I didn't follow the same technique for each envelope; I simply chose items that seemed to match the paper, then picked and pulled from the stash on my desk until I had fun gifts that suited my style. I didn't really even go for a set color scheme which is pretty strange for me! 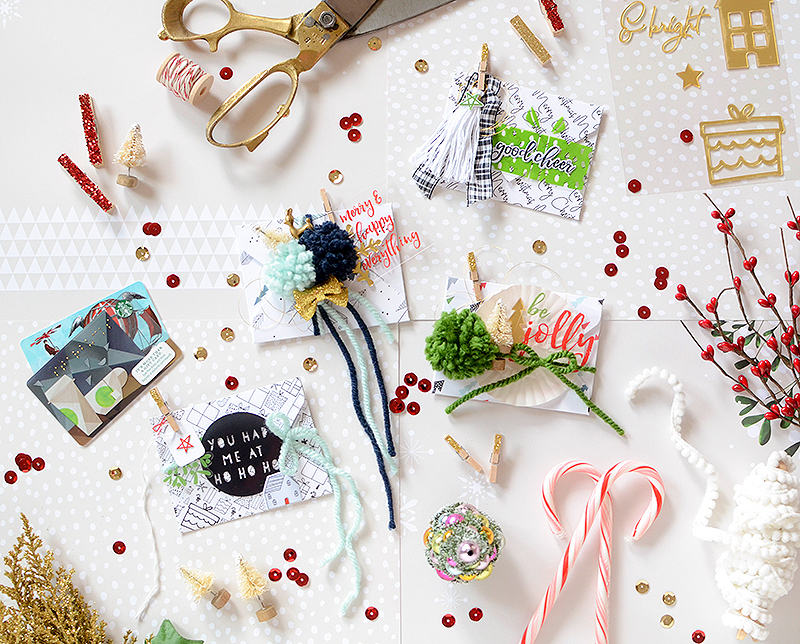 I did, however, choose Oh Joy patterns that were heavy on the black and white designs. 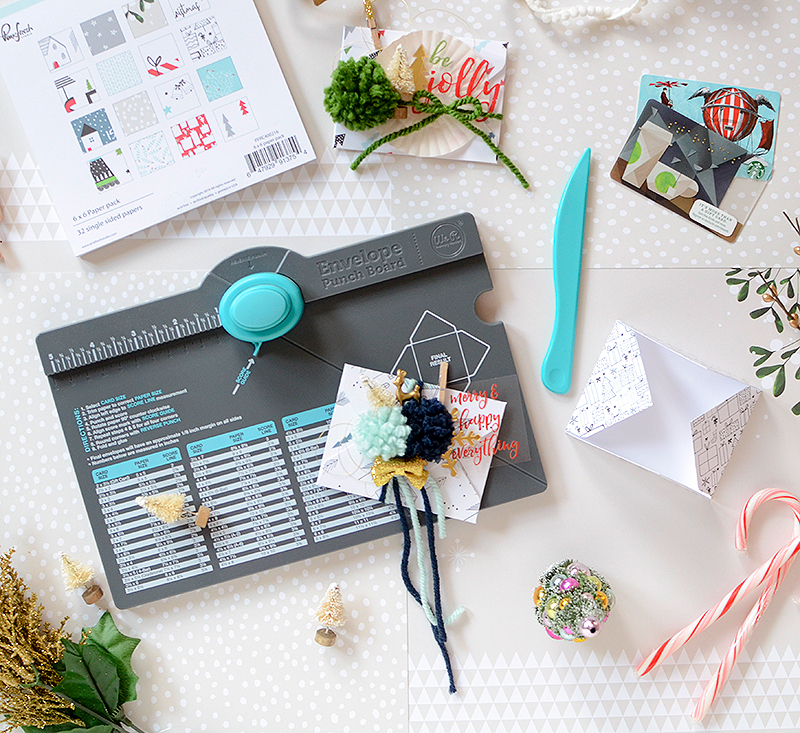 There is a little blue, red, and green in there, too, of course, but I liked the simple and modern graphic palette that Pinkfresh Studio does so well. And they aren't all big and fat, either. This one, for example, is for my husband and I know he's really not into pom poms and cute gold deer, and gold glitter bows don't make him go weak in the knees! I kept it simple. 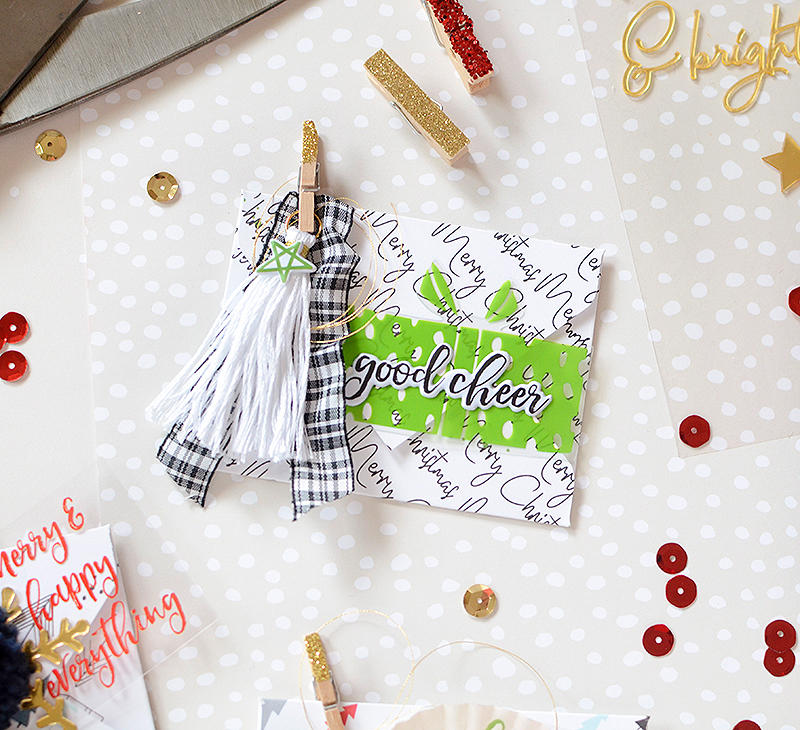 Black, white, green, and gold is a classic Christmas palette, in my humble opinion, so I was happy to play on this Merry Christmas paper with the green paint spatter, adding the acetate present and puffy star sticker. A bit of gold thread and the plaid ribbon--that I bought years ago, never used, and rediscovered in a closet last week--add texture and subtle patterns. In years past I have gone to great lengths to ensure that all of my gift wrap matches and follows a similar style. 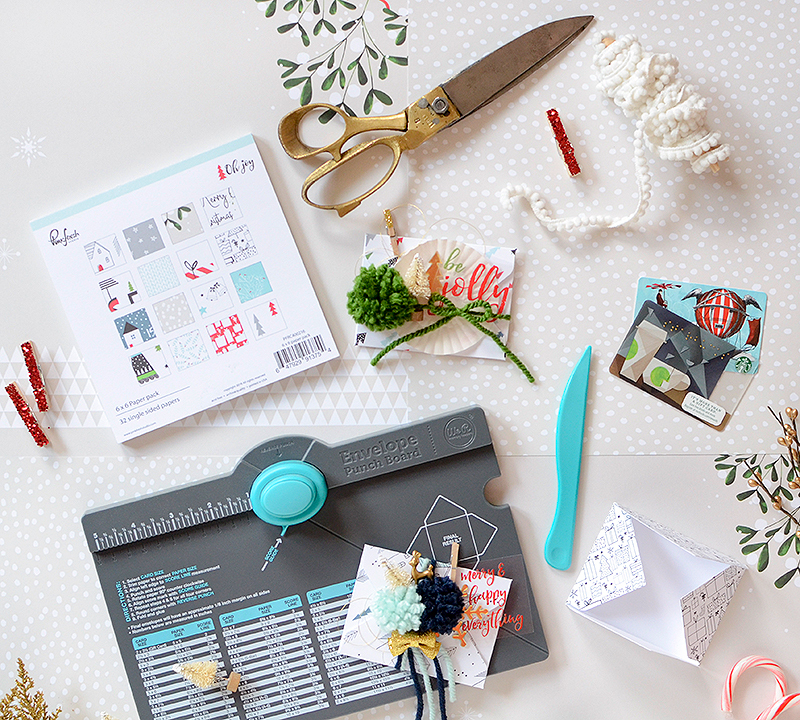 This year, I'm tossing that notion out the window, due to the fact that I have so many wrapping supplies, I'll never use them if I keep buying brand new things each Christmas. So that's why this set here is not matchy-matchy. I also intend to wrap most of my larger gifts in kraft paper with standard red and green trim, very similar to the gifts in last month's post. Maybe that's another reason--I can't make up my mind on what to use! I want to do it all! My next set sort of follows a color and supply rule, but I didn't enforce them. I love these muslin bags and I use them for everything. They are really convenient for gift giving and you can find them in a variety of sizes. These are 3"x5", but I also own them in measurements going all the way up to 8"x10". This is a great size for gift cards and there's enough room to add some fancy tea or chocolates. 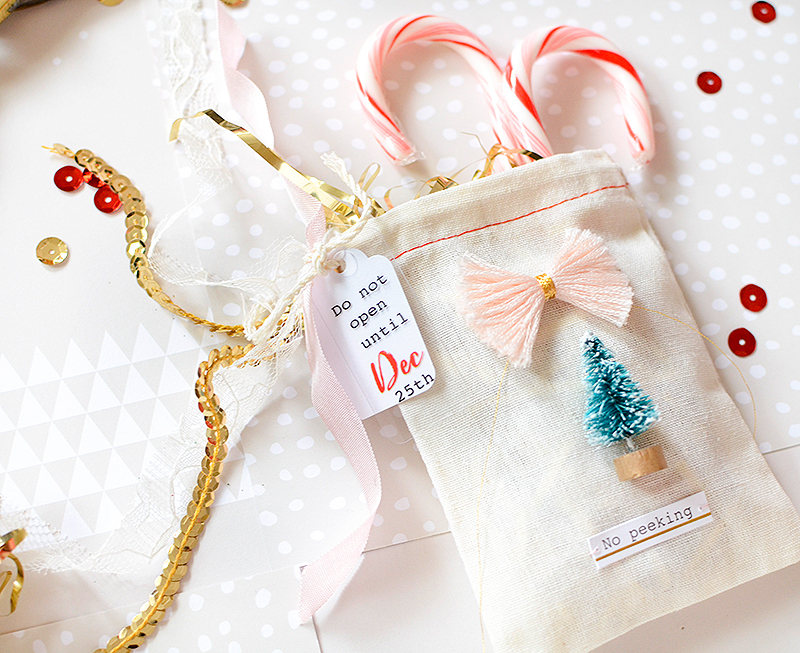 These are so simple to decorate, too! I chose a phrase sticker from Oh Joy, and paired it with an acetate tag, then added one or two other decorative elements and some trims. With Fabri-Tac, I adhered a pink fringe bow and teal-green bottle brush tree to the bag, along with my 'No peeking' sticker. You can glue that, as well, to ensure a good hold, or do like I did and put a couple of stitches through the ends to keep it in place. On the second bag, though the gold acrylic present is adhesive-backed, I added glue just to be safe. I added a plain white tag under each acetate tag so that I could write the recipient's name on the back. It also makes the message on the acetate easier to read. 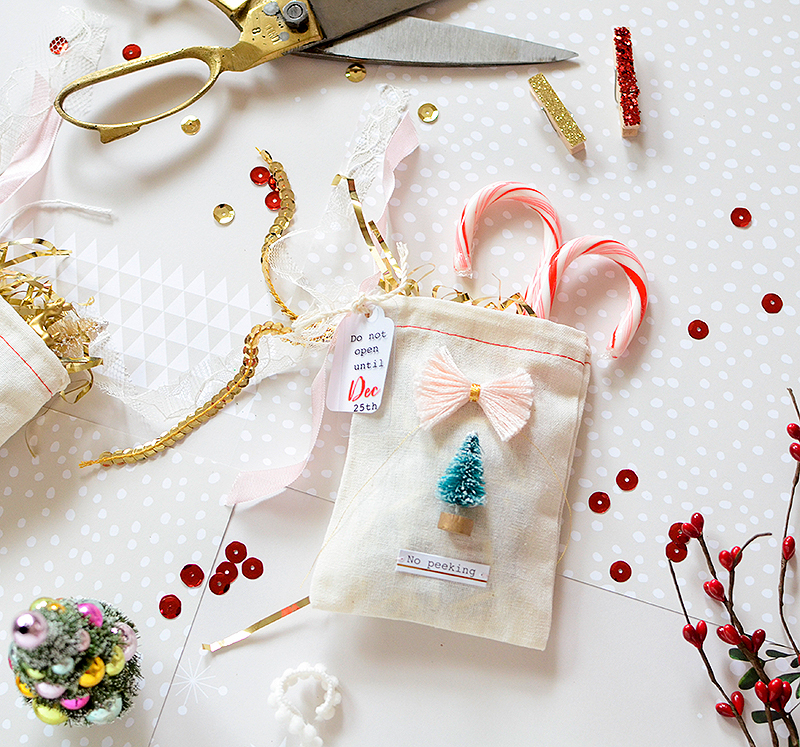 Another nice thing about these little bags is that your recipient can re-use them, which is always a bonus! I will say that the stitches took longer than simply glueing the sentiment onto the bag, but still, this whole project took less than 20 minutes start to finish. The most time-consuming part was just coming up with the idea itself! 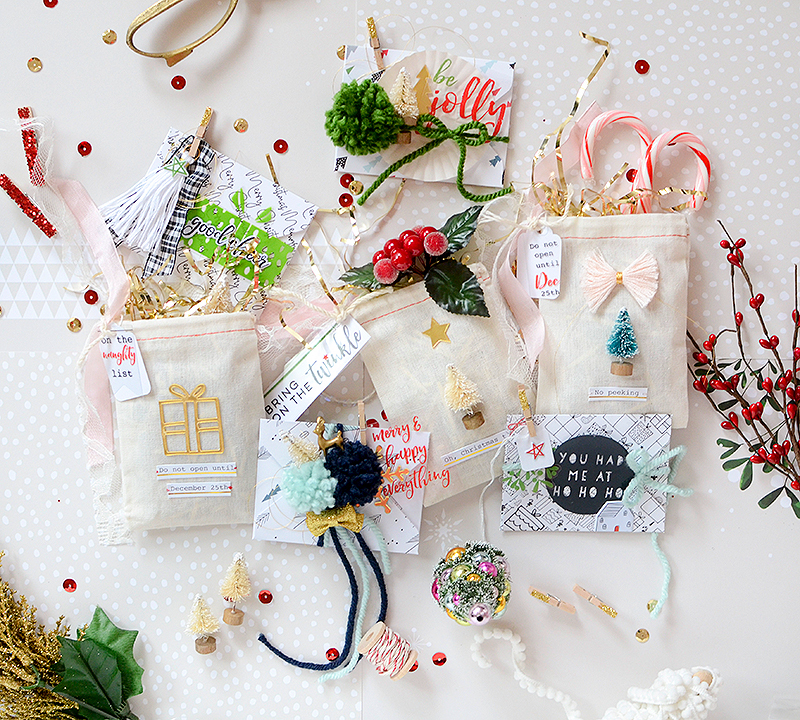 These bags don't need to be reserved for gift cards, either--jewelry, a keepsake ornament, or other small treasure will be just perfect tucked inside. 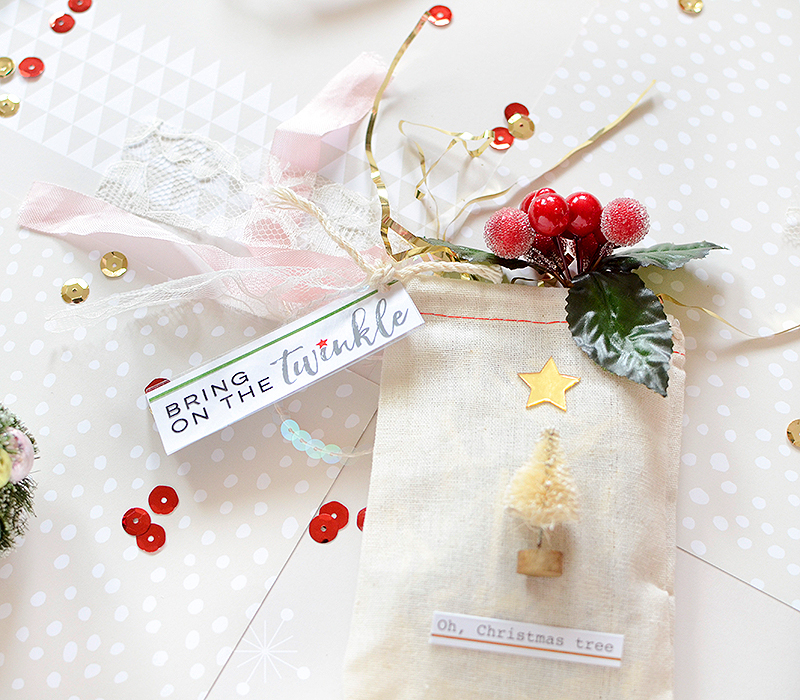 And if you can't find the muslin bags, try adhering the elements right onto your gift wrapped boxes or a paper gift bag. 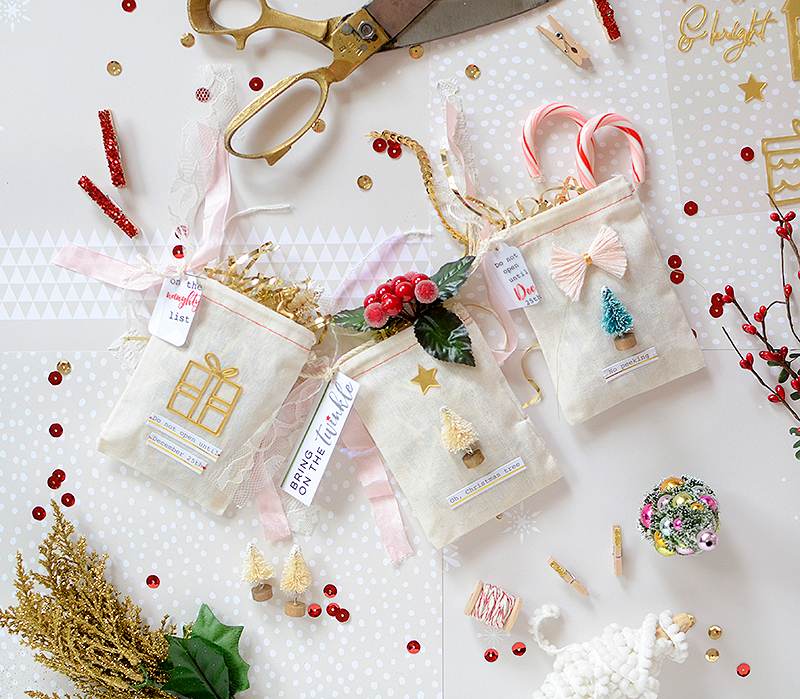 Imagine how pretty they would look against kraft paper--simple and clean! 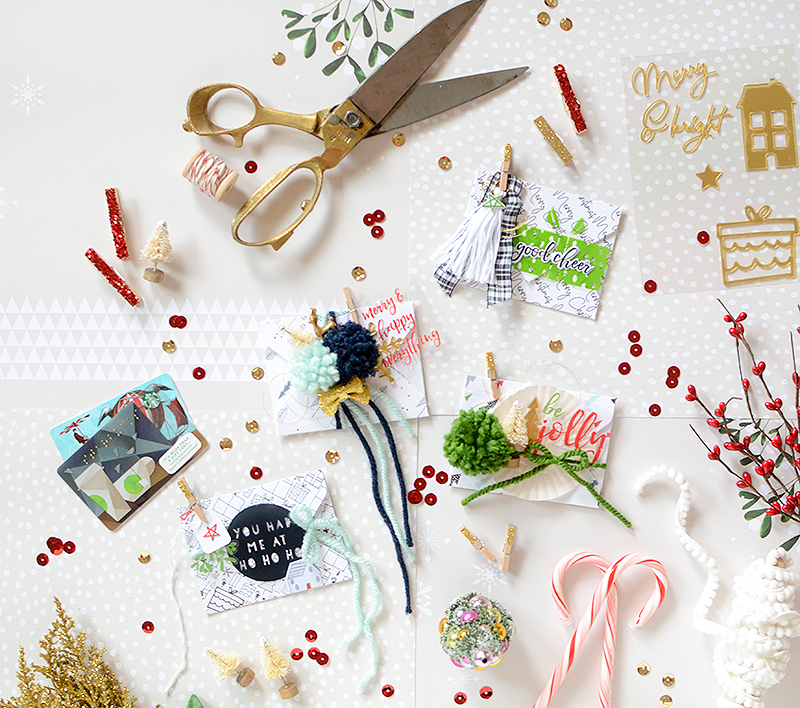 No matter how you present your gifts this year, just be sure you're taking the time to enjoy the season and the people who matter most. With my wrapping nearly finished, I intend to do just that! Happy holidays!